From Mumbai to Sindh! 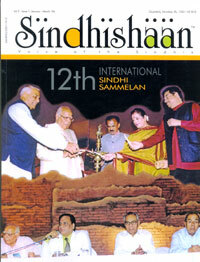 This issue of Sindhishaan captures the wonderful and proud moments of Sindhis reiterating and rejoicing in the glory of 'Sindhyat' during the 12th International Sindhi Sammelan held in Mumbai and the emotional ones of the group who relived their past and went down memory lane during their pilgrimage to the community's homeland SINDH. Although I belong to the post partition generation, I have had the good fortune of visiting SINDH, not once but thrice. And every time I went, I was amazed by the love and affection my parents and relations, with whom I traveled, received at the hands of their friends, erstwhile neighbours and colleagues both Hindus and Muslims - in equal measure. The hospitality, the warmth with absolute sincerity was an experience I can never forget. We visited Karachi where my father served in the Karachi Customs and my grandfather taught at the D. J. Sind College and was also its Principal. We visited Sehwan, my family hometown, and other places in Sind like Hyderabad and Sukkur. While going through Raj Daswani's account of the trip I relived my own visits and felt a strong desire to visit SINDH once again. Let us hope 2006 improves relations in the sub-continent and we learn to live like good friendly neighbours easing travel between India and Pakistan without any restrictions, and there be many more Raj Daswanis who can take groups from the community on a pilgrimage to SINDH. I conclude by wishing all readers and well-wishers of ‘SINDHISHAAN’ a glorious and memorable 2006.